Rental Trends are great at what they do! As a tenant for over 3 years, they have been wonderful to deal with. If I owned an investment property, I would want them to manage it. I've looked at other rentals when my lease was due to end in the past, but, I was so disappointed with the quality of agents out there. I really value Ann & Greg over significantly cheaper rent in a comparable (if not better) unit. Thanks for being great team!! Mel G.
Lots of us get a bit freaked out when we spot critters scuttling across the kitchen floor and, instinctively, we reach for the insecticide spray to kill. But there are ways we can deal with bugs without resorting to chemicals, and the uncomfortable truth is there are some creepy crawlies we're better off keeping around. Tanya Latty, an entomologist at the School of Life and Environmental Sciences at the University of Sydney, wants us to stop and think before we try to slay anything we find in our homes. "I'm not sure where it originates, this idea that your house is supposed to be sterile and your garden should have just flowers and no insects," Dr Latty says. "It's not achievable for one thing, but it also sets up this idea that as soon as you see an ant or a cockroach in your kitchen you have to nuke the place." Dr Latty and Bryan Lessard, aka Bry The Fly Guy from the CSIRO, share their tips to help you keep bugs at bay. Bug are gross… or are they? Are cockroaches, ants and flies wandering about your home actually dangerous to our health? Not really, says Dr Latty and Dr Lessard. "The main risk for things like cockroaches is the fact that bacteria can stick to their feet, so if a cockroach runs across some raw chicken on the bench and then runs across your salad, then it can move the bacteria from the chicken to the salad," she says. Some people can be allergic to cockroach exoskeletons and their poop, but that will only be a problem if you have large numbers of them. "Having huge numbers of cockroaches in your kitchen is probably not great," Dr Latty says. "But having one cockroach doesn't mean you're going to die of the plague. "You get way more [bacteria or pathogens] from another mammal than any insect." Dr Lessard says apart from mosquitos, which are a type of fly, even the biggest blowfly isn't very likely to bring you any harm. Ants also tend to not be a real health risk, unless you're unlucky enough to have a fire ant nest invading your dining space. The little black house ant, sometimes called sugar ants, aren't dangerous. Dr Latty says our sense of risk with insects, even when it comes to venomous spiders, tends to be "totally warped". "You're literally more likely to be hit by lightning than to die of a spider bite," she says. Why are these things in my house? It's not just cockroaches, ants and flies hanging out in your pad, you've probably got about 100 different species of insects living with you, most of which you don't even notice. Bugs move in with us for the food, water and warmth our homes provide. So if you're trying to evict unwanted roomies, you need to stop them having access to the things they want. Dr Latty and Dr Lessard say preventing unwanted insects from getting inside in the first place is better than launching chemical warfare. While having bugs in your house is not necessarily a sign of filth, the more food crumbs and spills you leave around, the more there is to attract hungry crawlies. Cleaning up around things like the toaster, and mopping up spills quickly will remove buggy temptations. Invest in a bin with a lid that stays shut and empty it regularly — particularly if you put food scraps in there. Rotting food is a buffet for bugs, many of whom have evolved to clean up the mess left by rotting meats and decomposing veg. "If you've left your kitchen rubbish out for too long, you might see some maggots in it, which is a bit of a shock," Dr Lessard says. "A lot of blow flies lay their eggs in rotting meat and they're really important for decomposing organic matter. "Without blowflies we would be waist-deep in road kill and dead animals." Dr Lessard says a compost in a far corner of the garden will keep the flies away from your house. Ants and cockroaches can be a real problem in the pantry, but they can't open jars. Put food stuff such as cereals and rice in something like a glass jar with a screw-on lid. Keep sauce bottles clean or keep them in the fridge where the ants can't get them. Ants are particularly drawn to sugary stuff, so keep anything sweet in air-tight containers. Most of the ants, flies and cockroaches we find in our houses have come in from outside, so just stopping them getting in the first place is a good idea. Flyscreens over windows and doors can be all you need to do to stop flies being a problem. If you spot a trail of ants coming through a crack in the windowsill, or notice small cracks in the bathroom where cockroaches could get through, fill the gaps. If you've removed all the food attracting bugs, but they're still hanging around, there are some extra things you can do. You might not like this advice, but having spiders around your house can help keep the roaches, ants, flies and mozzies away. "Huntsmans and daddy-long-legs are great at getting rid of the smaller flies and insects inside and especially mosquitos too," Dr Lessard says. "One of the best things you can do is to plant native plants that flower — like tea trees, grevilia, bottle brushes — in the backyard, because these will foster native insect predators, like lady beetles, hoverfly larvae and spiders that will actually help to keep the pest species down." "Ants use a chemical called a pheromone to tell other ants where the food is, so if you see a line of ants, just wipe down where the line was and it should get rid of the chemical cue for them to keep coming in that way," Dr Latty says. It doesn't matter what you use to wipe away an ant trail, just water can be enough, but acidic things like lemon juice can be good to discourage ants from coming back. If you have ants in the yard, they might be running a lucrative farming business at the expense of your garden. "They farm aphids the way people farm cows," Dr Latty says. "The aphids produce a sugary solution that they drink." Dr Latty says if you remove the ants' "sugar cows", they tend to go elsewhere, so wash off aphids when you see them. Dr Lessard says if you have aphid problems, some flies might actually help. "The hoverfly larvae, they look like little hairy caterpillars, and they eat aphids," he says. 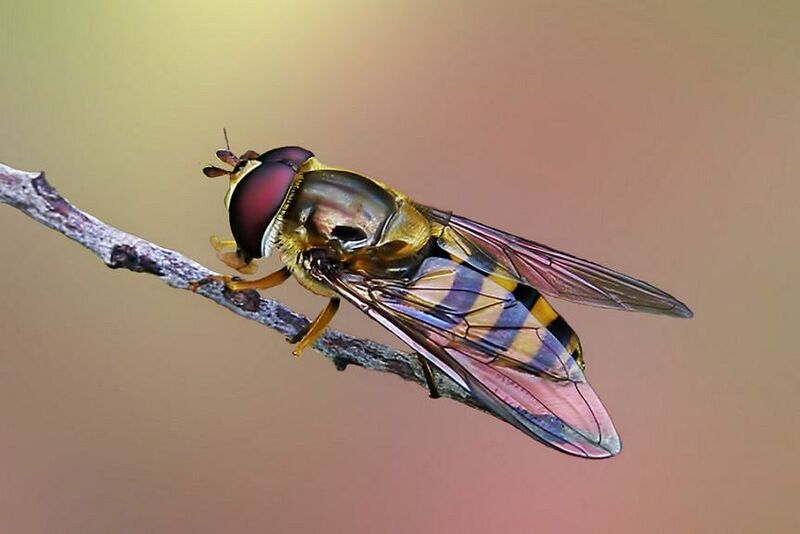 "Hoverflies are awesome, because they drink nectar and they pollinate native plants, like eucalyptus and tea trees." Using fly and bug sprays has a major downside in that it also kills off the good insects. This can throw things out of balance and create more of a problem than it solves, says Dr Latty. "[When using sprays] we kill off the predator insects and so we have more aphids and cockroaches and more flies and we get really upset and we spray more stuff," she says. "There's problems with developing resistance in insects, they are very good at developing resistance to things." Dr Latty says if you do have an real problem with a German cockroach or ant infestation, go with a bait. Baits come in containers designed for the target species to get in and out of. The poisons used usually harm the target pests and won't kill off any innocent bystanders. But Dr Latty says killing our tiny neighbours should be your last resort. "We think of insects being pests most of the time, but we forget that they're in the background doing all the important jobs," Dr Latty says. "They are the pest control most of the time, they're the pollinators, they're the waste management crew keeping us from drowning in our own waste, they're the base of the food chain feeding all the mammals and the fish and everything. "The insects are on our team, they're on our side. And we need them."